An English homeopathic physician named Thomas Cochrane secured a franchise in 1856 to build a street railway from Praça Tiradentes in downtown Rio de Janeiro to the suburb of Tijuca, a distance of 7 km (4.3 mi). Cochrane started construction in 1857, tested two trams (of uncertain origin) in 1858, and began offering free rides to the public on 31 January 1859. Brazilian emperor Dom Pedro II formally inaugurated the Estrada de Ferro da Tijuca the following 26 March. This was the second known passenger tramway operation in South America, preceded only by a line that opened in Santiago, Chile, on 10 June 1858. Ireneu Evangelista de Souza, the Viscount of Mauá, purchased the EFT in 1861, replaced the horse trams with steam-powered vehicles, and moved the downtown terminal from Rua Visconde do Rio Branco to Rua da Constituição in 1862. Track gauge of the tramway was 1676 mm (66 in). It closed in 1866, but was reopened by the Rio de Janeiro Street Railway [sic] in 1870. The first map below, published in 1858, is the earliest known commercial map of a street railway on the continent. 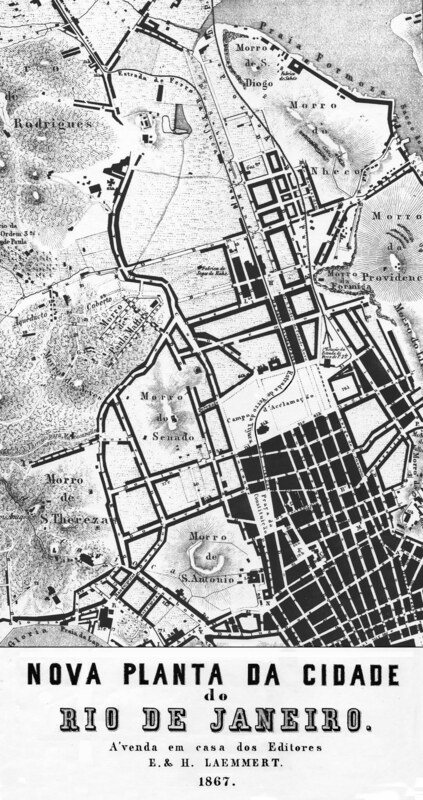 (No early map of the Santiago line has been found.) It shows only the eastern half of the tramway – the map was printed sideways, with north on the right – which continued west along Ruas Haddock Lobo and Conde de Bonfim to the corner of Rua Agostinho in Tijuca. The second map, published in 1867, is nearly identical but shows the 1862 route change from Rua Visconde do Rio Branco to Rua da Constituição. Noronha Santos. Meios de Transporte no Rio de Janeiro. Rio de Janeiro, 1934. "Companhia de Carros para Tijuca" in vol. 1, pp. 235-240. C. J. Dunlop. Subsídios para a História do Rio de Janeiro. Rio de Janeiro, 1957; reprinted 2008. "A Concessão Cochrane..." in 1957 edition pp. 179-198; in 2008 edition pp. 177-198.